Clay Cooper and his band were once the best of the best – the meanest, dirtiest, most feared and admired crew of mercenaries this side of the Heartwyld. But their glory days are long past; the mercs have grown apart and grown old, fat, drunk – or a combination of the three. Then a former bandmate turns up at Clay’s door with a plea for help: his daughter Rose is trapped in a city besieged by an enemy horde one hundred thousand strong and hungry for blood. Rescuing Rose is the kind of impossible mission that only the very brave or the very stupid would sign up for. It’s time to get the band back together for one last tour across the Wyld. Nicholas Eames was born to parents of infinite patience and unstinting support in Wingham, Ontario. Though he attended college for theatre arts, he gave up acting to pursue the infinitely more attainable profession of ‘epic fantasy novelist’. 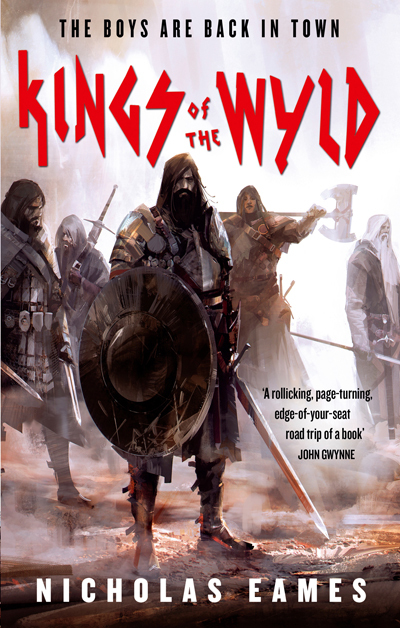 Kings of the Wyld is his first novel. Nicholas loves black coffee, neat whiskey, the month of October and video games. He currently lives in Ontario, Canada, and is probably writing at this very moment. The David Gemmell Awards for Fantasy | Powered by Mantra & WordPress.